This page gives a sample of the problems I work on; however, it cannot give a complete overview of my research. If you would like to get this overview, or if you would like to know the details of the work described below, please consult my list of publications or contact me by email. You can also look at the theses of the students I worked with. It might seem that noise does not contain any useful information, but noise can actually be a useful seismic source. The figure on the right, from joint work with Fan-Chi Lin illustrates this. 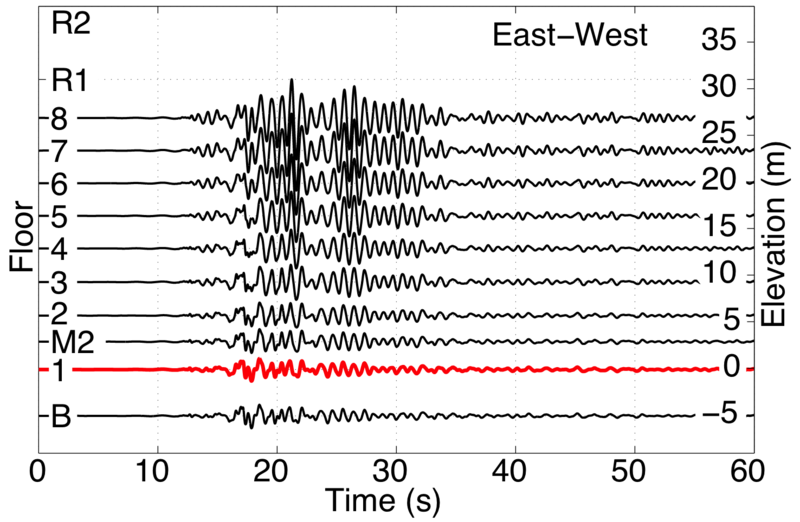 Noise recorded at the seismological station indicated with the asterisk is cross-correlated with noise recorded at the stations marked with triangles. The result is shown for two lag-times. The station marked with the star seems to act as a seismic source that radiates a spherical wavefront that propagates through the seismic network. There is, of course no real source present at that location, we therefore speak of a virtual source. 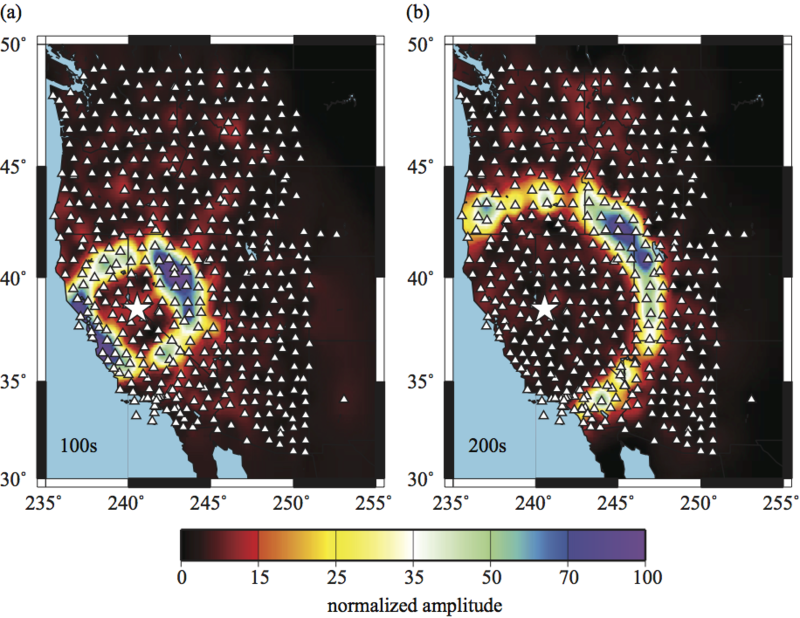 This line of research, also called seismic interferometry, has taken great flight since about 2000. For more details see my recent review paper. Vibrations in a building depend on the following three factors: (1) the excitation of the building at its base, (2) the coupling f the building to the ground, and (3) the mechanical properties of the building. All of these are unknown, and the left panel shows the motion recorded at different levels of a building in Japan. The waveforms on the left are not easy to interpret. We developed a technique to unscramble the scrambled eggs and retrieve the building response to an impulsive loading. 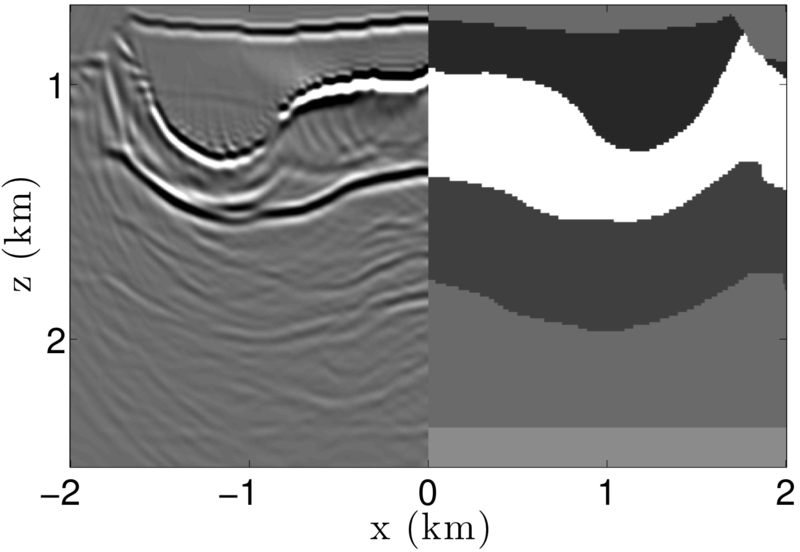 The figure on the right, from work of Nori Nakata shows the waveforms after deconvolution with the waves recorded at the first floor. The wavefield thus obtained consists of wave that bounce up and down between the top of the building and the first floor. Note that the waves change polarity at every reflection at the first floor; the reflection coefficient is equal to -1. 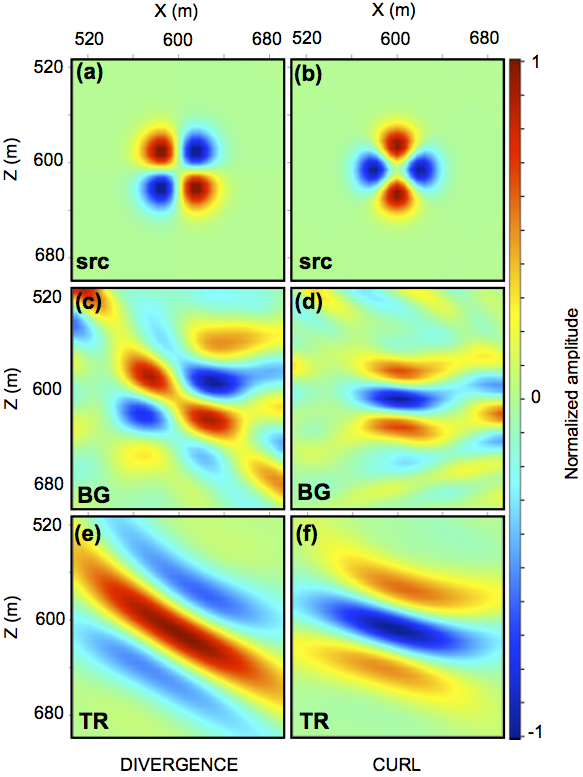 One can show that such deconvolved wave fields satisfy other boundary conditions than the real building does. The subsurface of the earth changes all the time. 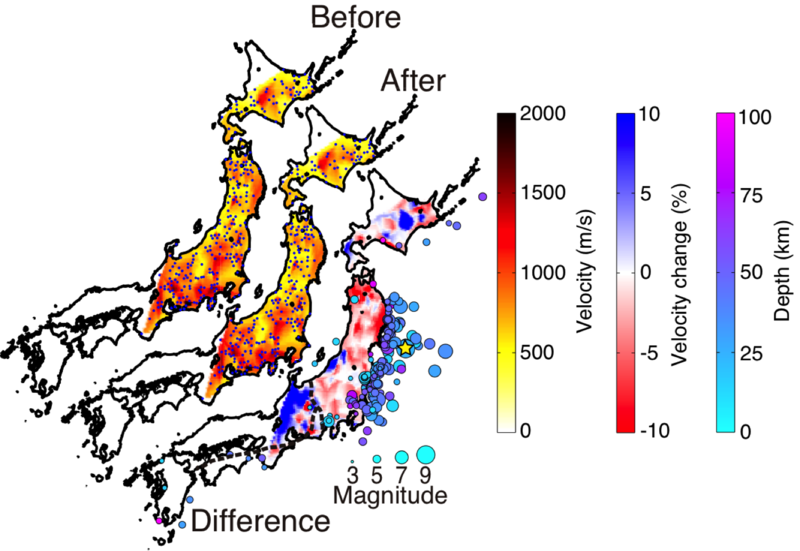 The left panel, from a study by Nori Nakata shows waves propagating between a seismometer at about 200 m depth and a seismometer at the earth's surface at a seismic station in Fukushima, Japan. Each waveform is for for a different earthquake. The wave for the Tohoku-Oki earthquake is shown by the magenta line. That wave clearly arrives later, which means that the near-surface has softened during the Tohoku-Oki earthquake. 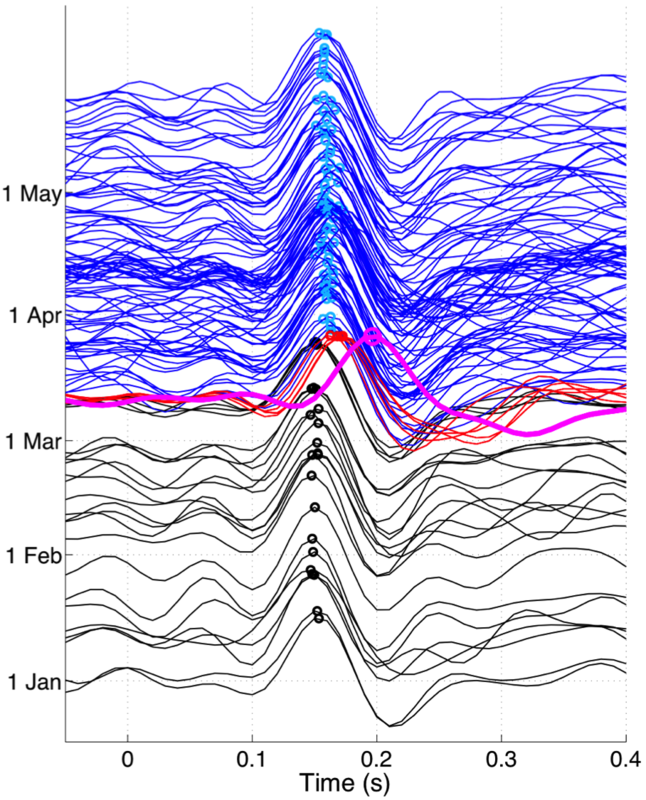 In fact, the waves in blue in the first three months after the Tohoku-Oki earthquake arrive later that the black waves recorded before the earthquake. There is long-term softening of the soil. As shown in the right maps, this softening is prevalent all over the eastern half of Japan (red colors in rightmost maps). In fact, we found that the properties of the near-surface also depend on rainfall, a result that was highlighted in Nature. Can one form an image through frosted glass without knowing the properties of the glass? This appears to be impossible, but techniques originally developed in quantum mechanics, called inverse scattering, make it possible to do so. Key principle is that the function that one solves for constructing the image is the function that tell us how the waves propagate through the unknown medium and focus on the imaging. This principle is explained by Filippo Broggini. The right half of the figures above give a model in which we seek to find the reflectors. The left panel is for Reverse Time Migration, the Cadillac of seismic imaging. The image contains much reflections that should not be there. The image obtained by the new technique of Marchenko imaging, shown in the right, correlates much better with the true interfaces. Note especially that the deep horizontal reflector near the bottom is much better reconstructed. We do this work in close collaboration with Kees Wapenaar and his co-workers at Delft University of Technology. In many applications one seeks to focus waves. 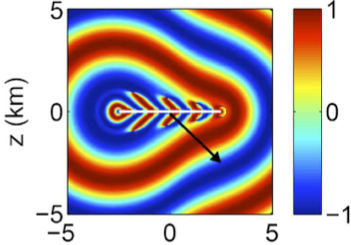 Focusing one of the ways in which one can study the source of waves, but one may also focus waves as part of an imaging algorithm, or because one seeks to modify a medium with focused waves (e.g. lithotripsy of kidney stones). The top panels above show the image for P and S-waves for a moment tensor when the array aperture is perfect. When the array used for the focusing in sparse and incomplete, which is usually the case in the earth, focusing can be a challenge, this is shown in the bottom panels for the commonly used technique of time-reversal imaging. Farhad Bazargani develop a method that translates recorded waves into new waveforms that are optimal for imaging. 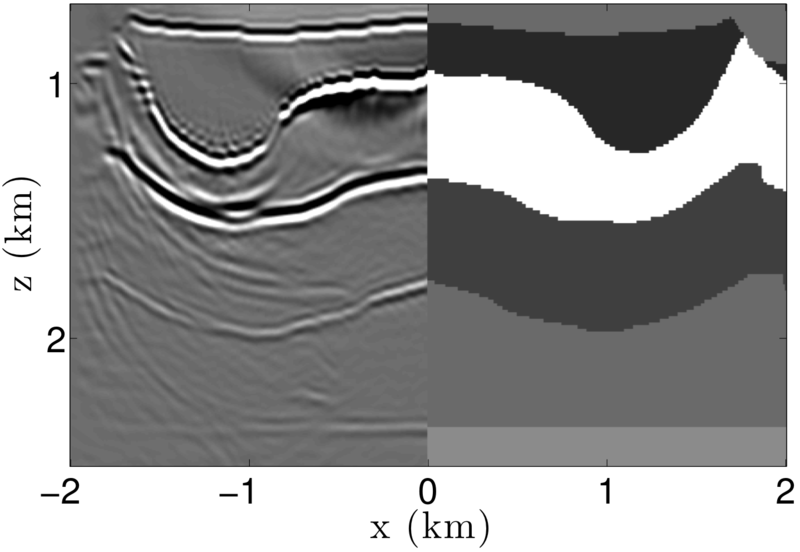 The image of the source reconstructed with this waves is shown in the middle panel. Although the image thus obtained is far from the image in the top panel, it is a big improvement over the images from time reversal imaging. Can one send a diffusive field in a specific direction? It seems that the answer much be negative; how can one make perfume diffuse preferentially in one specific direction. Yet, this can be done when one has an array of source (perfume bottles) that vary sinusoidally in time. 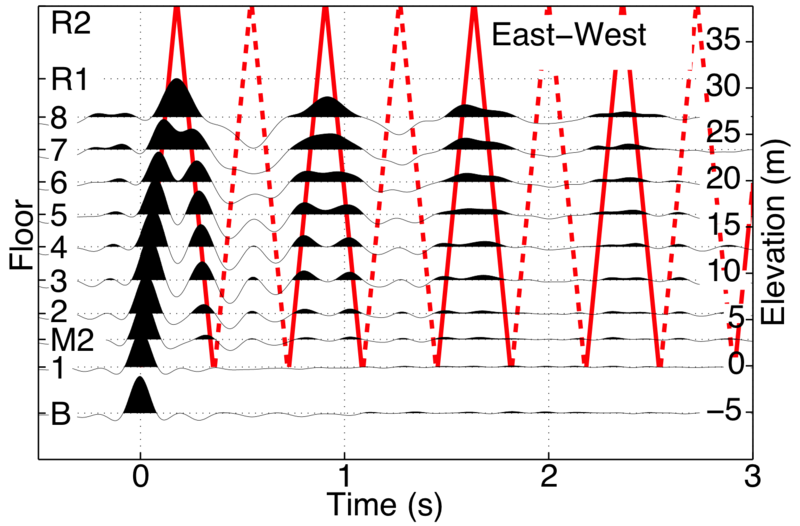 The figure above shows a diffusive field that is radiated in the direction of the black arrow using an array of sources placed on the white line. The method used creates a synthetic aperture source whose properties can to a large extent be specified. In a joint project with Shell Research we applied this to Controlled Source Electromagnetics (CSEM) as used for seismic exploration and production. For more details see the PhD-theses of Yuanzhong Fan and Allison Knaak. Return to the top of Roel Snieder's Research page.